In November 1838, Fr d ric Chopin, George Sand, and her two children sailed to Majorca to escape the Parisian winter. They settled in an abandoned monastery at Valldemossa in the mountains above Palma where Chopin finished what would eventually be recognized as one of the great and revolutionary works of musical Romanticism: his twenty-four Preludes. There was scarcely a decent piano on the island (these were still early days in the evolution of the modern instrument), so Chopin worked on a small pianino made by a local craftsman, Juan Bauza, which remained in their monastic cell for seventy years after he and Sand had left. Chopin's Piano traces the history of Chopin's twenty-four Preludes through the instruments on which they were played, the pianists who interpreted them, and the traditions they came to represent. Yet it begins and ends with the Majorcan pianino, which assumed an astonishing cultural potency during the Second World War as it became, for the Nazis, a symbol of the man and music they were determined to appropriate as their own. After Chopin, the unexpected hero of Chopin's Piano is the great keyboard player Wanda Landowska, who rescued the pianino from Valldemossa in 1913, and who would later become one of the most influential artistic figures of the twentieth century. 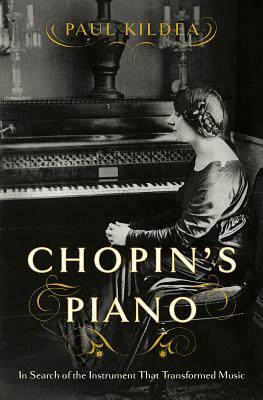 Paul Kildea shows how her story--a compelling account based for the first time on her private papers--resonates with Chopin's, simultaneously distilling part of the cultural and political history of mid-twentieth century Europe and the United States. After Landowska's flight to America from Paris, which the Germans would occupy only days later, her possessions--including her rare music manuscripts and beloved keyboards--were seized by the Nazis. Only some of these belongings survived the war; those that did were recovered by the Allied armies' Monuments Men and restituted to Landowska's house in France. In scintillating prose, and with an eye for exquisite detail, Kildea beautifully interweaves these narratives, which comprise a journey through musical Romanticism--one that illuminates how art is transmitted, interpreted, and appropriated between generations.